Create and manage polls inside your site dashboard. Display ratings above or below posts, pages and comments. Ratings enables your readers to vote on content shared on your site. Polldaddy polls is an easy way to gather opinions, votes, and see and share results immediately. Polls are also a great way to engage readers. Polldaddy ratings can be displayed above or below posts, pages and comments. Ratings enables your readers to vote on content shared on your site. Reader click on the Rating icons to share their vote. 1. Log into your Polldaddy account (or sign up for an account). 2. Go to your Polldaddy API account page. 3. Add your API key name and click Generate API Key. 4. Copy your new API key. 5. Go to Settings > Polls. 6. 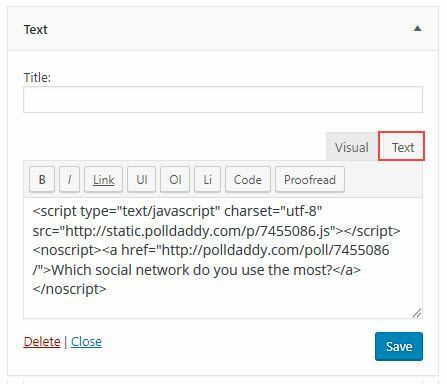 Paste your API key into Polldaddy.com API key field and click Link Account. 2. Click on the Add Poll icon above the editor. 3. 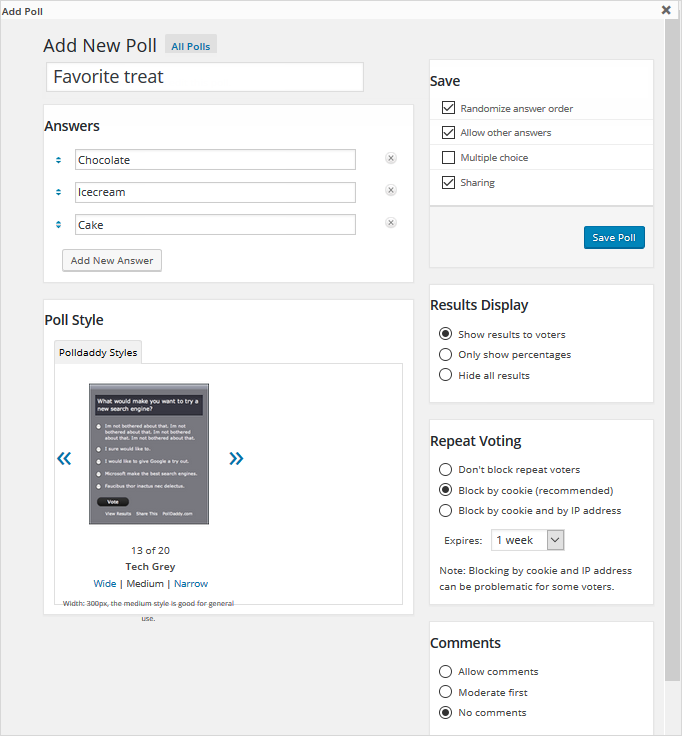 The Add Poll window will launch where you’ll see your existing polls and an option to create a new poll. 5. You may see a message that says “You are not allowed to edit this post”. You just ignore this message. 6. Add your questions and configure the poll options to suit your needs. 8. A message will appear at the top letting you know your poll has been created. 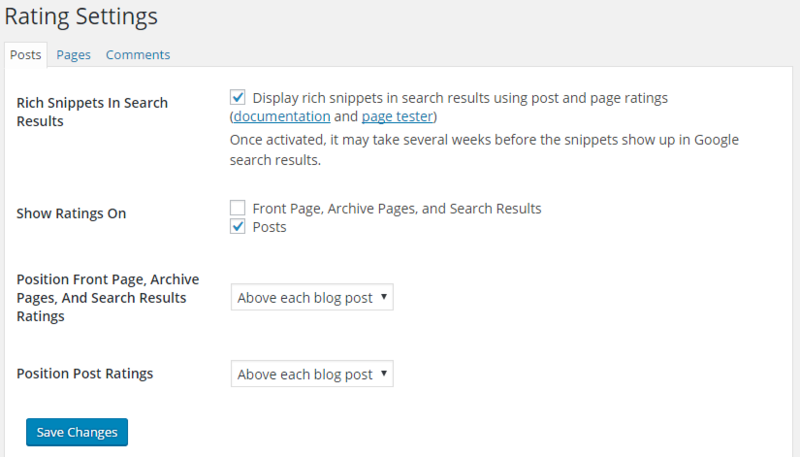 Click on Embed in Post to insert it into your post or page. 9. 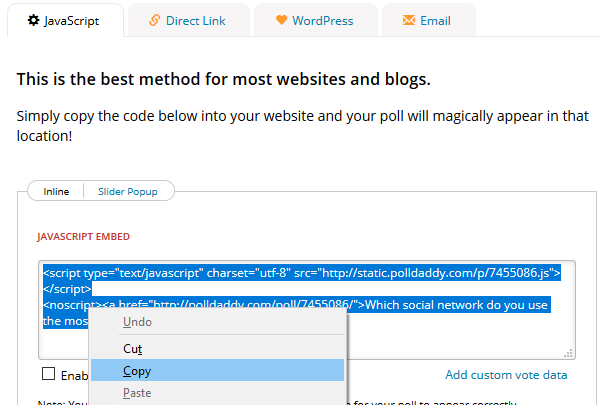 The Polldaddy shortcode will be inserted into your post. 10. When you view your published post or page you’ll see your new poll. 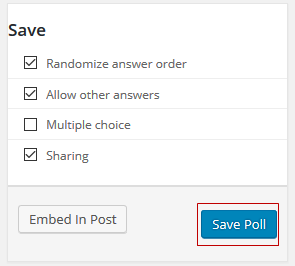 To insert a poll you’ve already created you click on the Add Poll icon above your editor when creating/editing a post or page. The Add Poll window will launch where you’ll see your existing polls. Click on the Embed in Post button underneath the existing poll to add it to your post/page. 1. Log into the dashboard of your Polldaddy account. 2. Click on Design Poll under the poll you want to add. 3. 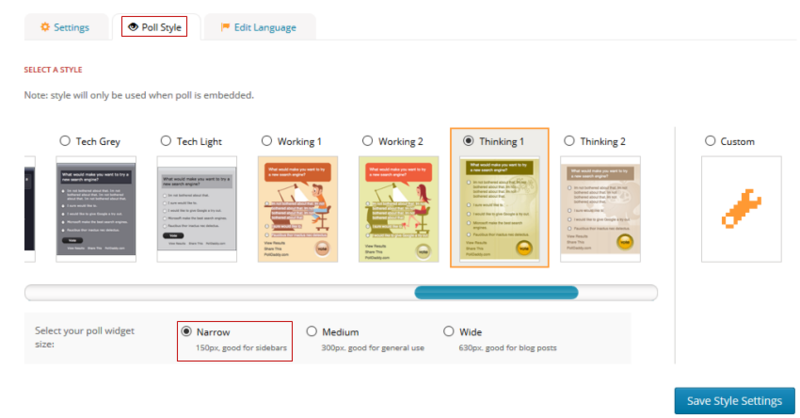 Click on Poll Style tab and make sure Narrow is selected. It must be set to Narrow otherwise it will be too wide for most sidebars. 4. Click Save Style Settings. 5. This will redirect you to the collect vote page. Copy the embed code. 6. Go to Appearance > Widgets in your dashboard. 7. 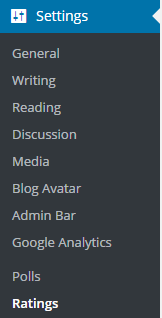 Add a text widget to the desired sidebar. 8. Click on the text tab, paste the embed code into the text widget and then click Save. 1. Go to Settings > Rating. 2. 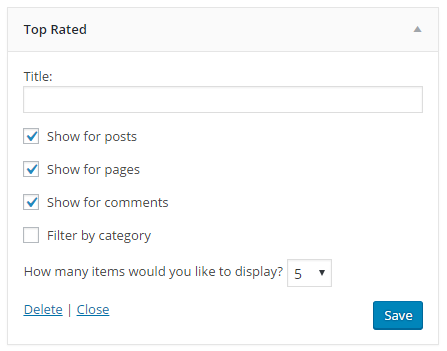 Select where you want to display ratings on, i.e posts, pages or comments, and where you want the rating displayed and then click Save Changes. 3. Once configured you should see the ratings option on your content. You can display your top rated content by adding the Top Rated widget to the desired sidebar. Title: Allows you to add your own custom title. Show for Posts, pages, comments: allows you to control which content is displayed. Number: Controls the number of items that are listed.